Ransomware is one of the biggest threat to any business of whatever size. There is only one way to escape once you are in the trap of hackers. And that is to pay the ransom. In fact, depending on the level of the hacker, you never know if the complete data is safe or not. What if the hacker replicates the whole data during this process? You will still be in a trap despite paying a heavy amount. That is where CryptoSafeGuard comes into the picture. BackupAssist launches this Ransomware Protection tool for Small and Medium-Sized Businesses (SMBs). The new software protects backups from encryption by Ransomware. That means as the product claims, SMBs need never pay ransom again. 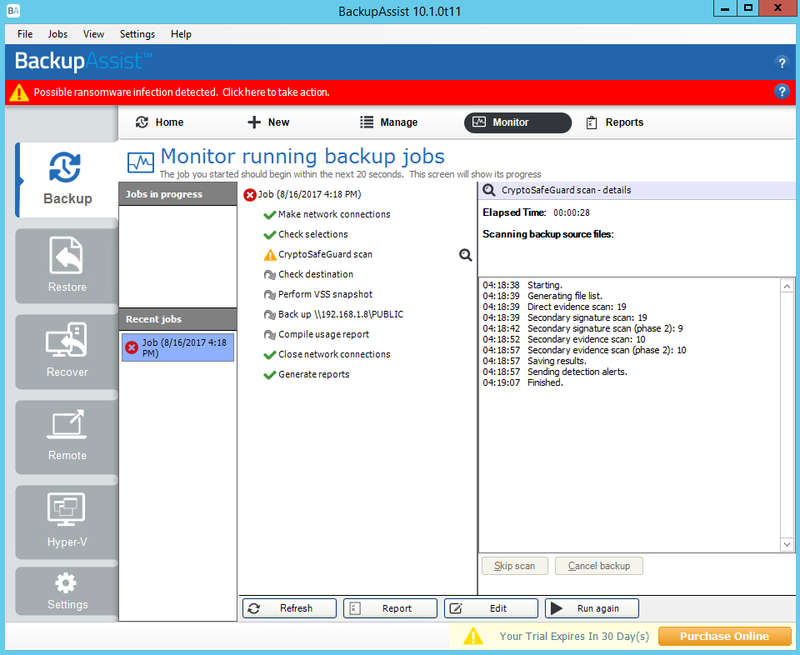 BackupAssist® is a frontrunner in automated Windows server backup and recovery software for small and medium enterprises (SMEs). This is the worldwide launch of CryptoSafeGuard™ ransomware protection. CryptoSafeGuard™ ransomware protection is robust enough to protect an enterprise at a very affordable price. Basically, CryptoSafeGuard protects backups by stopping the back up of infected files and thus preventing encryption of backups. That proves its strong capability against ransomware. It has a capability of complementing existing anti-malware solutions thus adding an extra layer of detection at the data level. In fact, due to this, it also provides extra shielding around backups. What they call it as – Active, simple and non-intrusive. Protects – It protects your backups from corrupting your backups from the BackupAssist computer. Detects – It continuously scans and detects the effects of ransomware activities in the source files under backup protection. Responds – It automatically raises alerts to your administrator upon detection of crypto-corrupted files. These alerts can happen via SMS and E-mail. Preserves – It intelligently blocks future backup jobs from running thereby keeping the last-known good backup safe and intact. A 2016 Osterman Research report “Best Practices for Dealing with Phishing and Ransomware” offers some interesting statistics. It says 51% of those responding to a survey had been successfully infiltrated by ransomware, malware, or a hacker one-to-five times. “Ransomware is a very real and critical problem that every organization regardless of size must address through a variety of means, including good backup processes and technology – such as BackupAssist and its CryptoSafeGuard solution,” says Michael Osterman, President, Osterman Research. CryptoSafeGuard is available September 1, 2017, and is includes with BackupCare. The subscription of BackupCare starts from $106 USD for 12 months when you bundle it with a new purchase. In fact, you can request a free trial of CryptoSafeGuard software by visiting here.